Dr. Lari Häkkinen first became interested in fibroblasts as a dental student doing research at the University of Turku in Finland in the mid-1980s. Fibroblasts are the most common connective tissue cells in the body and important for wound healing. Häkkinen was curious about how these connective cells behaved and noticed that fibroblast cells from a given tissue or from various body sites—such as the gums and skin—look different from each other in tissue culture. “Researchers weren’t paying attention to that in those days. We had no clue about why some fibroblasts looked different, or if there were differences in how they behaved. But I’ve been fascinated by these differences ever since,” says Häkkinen, a professor in the Department of Oral Biological & Medical Sciences, and a leading researcher in the cell and molecular biology of wound healing. Only a dentist would be sufficiently curious to delve deeply into these questions and make the eureka connection between the two seemingly unrelated observations. The answers he found are pivotal to his current groundbreaking experiments to harness the magical healing properties of gingival fibroblasts to repair severe wounds for burn victims and surgical patients without scarring. Häkkinen discovered, through years of painstaking research, that fibroblast cells in gum tissue not only look different than skin fibroblasts, but they also act differently. Gingival fibroblasts have some distinctive properties that may promote fast and scarless healing in the oral cavity. These special protective properties help to explain why the gums of dental patients heal so well after surgery. More than 100-million people in the developed world alone acquire scars from burns or injuries annually. While advances in acute care have increased survival for burn victims, this has resulted in more patients with severe scarring and about 70 percent of burn patients develop raised, thick red scars on their skin, known as hypertrophic scars. Many surgical procedures can also lead to scarring. In North America, treatment of scarring costs up to $20 billion a year. Despite advances in wound care and progress in research to understand factors that may reduce scar formation, no effective therapy to prevent scar formation exists today. Häkkinen has devised an oral-based cell therapy that exploits the unique, potentially regenerative properties of gingival fibroblasts to improve skin wound healing. With approximately $850,000 in funding over five years from the Canadian Institutes of Health Research (CIHR), Häkkinen has developed and is testing bioengineered skin substitutes. These skin substitutes, which contain millions of gingival fibroblast cells, are being used to treat deep skin wounds in preclinical models relevant to humans. As principal investigator for the project, he is collaborating with co-investigator Dr. Hannu Larjava, also a professor in the Department of Oral Biology & Medical Sciences, to determine whether this novel therapy effectively promotes more rapid and scarless wound healing. “Do the gingival fibroblasts prevent scar formation in skin wounds? If we can show that they do, this could potentially benefit many adults and children all over the world who develop scars from burns, injuries and surgery each year,” Häkkinen says. Häkkinen learned a great deal about why deep skin wounds heal slowly and often lead to severe scarring. To find a novel and better way to heal them, he has pieced together, over the past decade, the puzzle of why wounds in the oral cavity—especially gingival tissues—heal faster and with less scarring than skin wounds. The next step was to home in on potential differences at the cellular level. “Fibroblasts are a key cell type, so we compared the different properties of gingival and skin fibroblasts,” he says. Häkkinen’s experiments showed gingival fibroblasts have many distinctive properties that contribute to better healing and less scarring. They suppress immune responses more potently than skin fibroblasts do, and they display higher levels of molecules that are involved in controlling inflammation. Gingival fibroblasts express a greater abundance of cytokines (immune signalling proteins) that promote restoration of epithelial layers over the wound. They stimulate angiogenesis, which is new-blood-vessel formation essential for wound repair. Gingival fibroblasts also produce less collagen, a hallmark of scarring. Why are there such profound differences between oral and skin wound healing, and oral and skin fibroblasts? Häkkinen believes these differences likely have an evolutionary purpose. “Our teeth have developed for grinding food of varying consistencies rather than for just swallowing large pieces of prey. Scarring in the oral cavity would have been detrimental to food intake by ancient humans. Scarring of the skin, on the other hand, may be the price we pay for powerful inflammatory reactions against bacterial insults,” he and Larjava wrote in the article “Exploring Scarless Healing of Oral Soft Tissues,” published in the Journal of the Canadian Dental Association in 2011. Another intriguing clue on the path to solving the puzzle of scarless healing arose from observations about the major differences in fetal and adult skin healing. In humans and other mammals, fetal skin heals without scars until the late third trimester of gestation. Healing in embryonic skin also promotes the expression of specific molecules, such as tenascin-C, that are associated with scarless healing, and as in oral wound healing, there’s less inflammation associated with healing embryonic wounds. “Gingival cells seem to have the same kinds of properties as fetal skin cells, which are prone to non-scarring. This is another promising sign that maybe we can harness those properties to heal skin wounds better,” says Häkkinen. One more key difference between gingival and skin fibroblasts lies in their different embryonic origins—a feature that could prove vital to the success of gingival cell transplants. 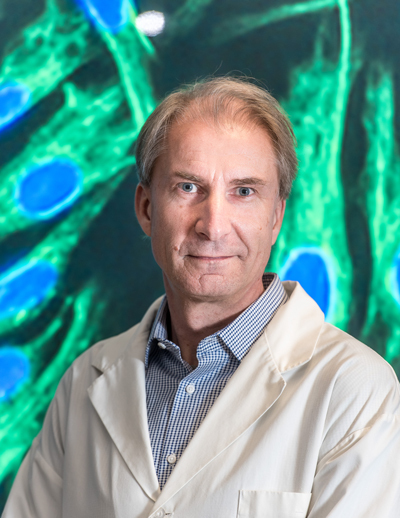 Häkkinen collaborated with a research group from Paris, led by Dr. Benjamin Fournier of Paris Diderot University, to show that most gingival fibroblast cells in adults are derived from the neural crest (early embryonic cells that give rise to the face, neck and oral cavity), whereas skin fibroblasts originate from the mesoderm (the middle of three germ layers of the embryo). “Studies from various labs have shown that, in adult tissues, cells originating from the neural crest during embryonic development may have different properties than cells that originated from other parts of the embryo. These properties include a wider regeneration potential in the neural crest-derived cells, which implies they may promote wound healing better than other cells,” he explains. To explore this potential, he and his team created a bioengineered skin substitute containing millions of gingival fibroblast cells, which can be grafted onto a preclinical skin wound healing model. The skin substitute is composed of a resorbable Vicryl mesh (a suture material used by surgeons to stitch open wounds), which supports the growth of millions of fibroblast cells in culture and is used to transport and maintain the cells at the wound site. “The cells are transplanted into the wound site, and the suture material is completely dissolved within 60 days,” he says. Other researchers have done a few small studies of gingival fibroblasts for different applications, with encouraging results as well. “When compared to skin fibroblasts and nasal fibroblasts in a tracheal (windpipe) regeneration model, only gingival fibroblasts induced normal regeneration of tracheal epithelium. Gingival fibroblasts were also tested in experimental therapy for a carotid artery aneurysm, and their grafting into the artery walls caused a reduction in lesions, while lesions treated with skin fibroblasts continued to grow,” explains Häkkinen. Häkkinen is collaborating with Dr. Anthony Papp, medical director for the BC Professional Firefighters’ Burn Unit at Vancouver General Hospital, and a clinical professor in the UBC Faculty of Medicine, on the preclinical studies of gingival fibroblast treatment and strategies to clinically apply and tailor the therapy for different groups of skin wound patients. “Dr. Papp has been important in helping to plan and perform the preclinical experiments in a way that is relevant to patients. His expertise has been valuable for us to understand the special challenges that exist in treatment of severe wounds today and how to improve those treatments in the future,” Häkkinen says. For patients who suffer deep wounds, including severe burns, the gold standard for treatment is an autologous skin graft (using tissue or cells from the patient’s own body) from undamaged skin. “The skin graft’s disadvantages include limited availability of tissue from the donor, the wounds created, including scarring, and potential infections at the donor sites where skin is taken,” says Häkkinen, noting that skin substitutes that promote scarless wound regeneration could improve healing at both the donor and graft sites. He’s testing skin substitutes containing autologous gingival cells in his current preclinical studies. Autologous cells are more likely to have a long-term healing effect because they won’t be rejected by the immune system. (In general, transplanted skin cells from another person may function only for a short time due to immune rejection.) The main and most obvious clinical applications for autologous gingival cells would be in planned procedures, such as resective surgeries (to remove all or parts of diseased tissues and organs) and scar revisions (surgery to minimize scars). Häkkinen’s discovery of a promising scar prevention therapy for skin wounds has been decades in the making. It was sparked by his initial curiosity and fascination with the look and behaviour of fibroblasts in the lab. While doing research for his PhD in Finland, he earned income by treating patients and through part-time clinical teaching at the dental school, where he demonstrated surgeries to students. Those early clinical experiences awakened his interest in the little-known, and until now poorly understood “magical” healing properties of oral gingival tissues. As an undergrad at dental school in Finland, Dr. Lari Häkkinen had an opportunity to get involved in research as a summer student. That early exposure and hands-on experience doing basic experiments in cell biology ignited his interest in research. It was also the springboard to a long and highly productive career as a research scientist in the fields of wound healing and chronic inflammation in the Laboratory of Periodontal Biology at UBC Dentistry. “I had a chance to do research as an undergrad and be given excellent mentorship. That got me excited,” says Häkkinen, who has supervised dozens of students doing research at the undergrad, graduate and postdoctoral levels since joining the faculty in 1999. He draws on his own experience as an undergrad to give UBC Dentistry students meaningful exposure and early opportunities to do research. “I try to engage and motivate students at the undergraduate level and give them a feel for what research is like in the lab. That encouragement and mentoring was a driving force for me,” he says. His enthusiasm for research is contagious and helps students flourish. Students Häkkinen has supervised, or co-supervised, have earned about 40 awards for their research. He was the graduate supervisor for Dr. Rana Tarzemany, for example, who won several awards, including the prestigious Volpe Prize in 2015 for the best clinical research in periodontology by a dental student in North America. It was the first time a student from a Canadian school had won the award. Tarzemany was recognized for her journal article “Expression and Function of Connexin 43 in Human Gingival Wound Healing and Fibroblasts,” published in PLOS ONE. By using various histological, cellular and molecular biology techniques, she discovered that connexin 43—a molecule that regulates the expression of wound healing-associated genes in gingival and skin fibroblasts—was less abundant in human gingival fibroblasts and could provide a future drug target to alleviate tissue scarring in skin wound healing.